It’s easy to see green in the Finger Lakes with it&apos;s fields of winter wheat, winter rye, and with eleven Golf courses in Cayuga County, greens will be lush as spring settles in. Golfers are lucky with the varied amount of public golf courses that dot our lovely county: From Meadowbrook in Brutus, Cranebrook in Throop, Indian Head in Aurelius, Highland in Sennett, Wells College in Aurora, Hickory Ridge in Cato, Springbrook Greens in Fair Haven, Lakeview and Dutch Hollow in Owasco, Fillmore in Locke, and the King Ferry Golf Club, golfers are certainly blessed with greens galore. 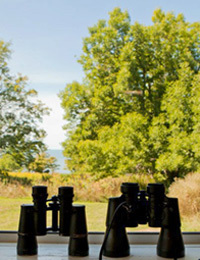 If golfing isn’t your thing, but hiking is then once again people in Cayuga County are in luck: Sterling Lake Shore Park and Nature Center at the northern tip of the county is a Mecca for bird watching, hiking, cross country skiing, and for finding early spring wild flowers. Regardless, there are plenty of outdoor activities for everyone! In the middle of the county we have Howland Island State Wildlife Management Area and a section of the Montezuma National Wildlife Refuge’s wetlands. Down on the south western border we are blessed with Long Point State Park on the shores of Cayuga Lake, and on the south eastern side of the county we are fortunate to have Bear Swamp State Forest, Frozen Ocean State Forest, Fillmore Glen State Park, and Summer Hill State Forest. Birding? Visit the Dorothy McIlroy Bird Sanctuary - 157 acress of preserve with some of the highest breeding bird diversity in the Finger Lakes! So if you are looking for green for St. Patrick’s Day—we got it covered! May the hand of a friend always be near you, And May God fill your heart with gladness to cheer you.